You may have noticed that we have a new verse for the year and I think it is time I explained why. This is the first part in a series of articles which aims to show us how this particular passage should shape our lives this year. One of the most frightening realities in the Bible is how often those who profess to be true worshipers of God are exposed to be false. This reality was never more clearly and tragically displayed than in the Pharisees. One would expect the most zealous and orthodox of all the sects of Judaism to be the most excited about the arrival of their God. The Pharisees should have been Jesus’ most passionate disciples. Instead they hated him and systematically went about engineering his execution. This should give us pause. Woe to any Evangelical who thinks they are not capable of the same self-deception. 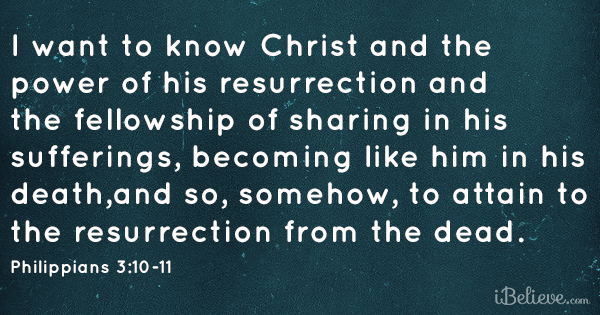 At the core of being a disciple of Jesus is knowing Him and treasuring Him. If you do not know Jesus and love him, then you are not a disciple of Jesus. It does not matter how correct your doctrine is, how many of the spiritual disciplines you have mastered, how long you have been a part of a local church, how gifted you are or how much people admire you. You are deceiving yourself. This is critical for us as a fellowship. We are going to spend a lot of time thinking about spiritual growth, evangelism, missions, youth ministry, preaching, training, finances, theology and numerous other aspects of Christian and church life. If we take our eyes off Jesus as our supreme treasure then we fail. Therefore the first lesson we learn from our verse of the year is to remember that being a Christian is foremost about the knowing Jesus. Is this still your main priority for 2015? Is this what you want most for your brothers and sisters at Bethesda?